Both of the tortillas above have the same pH when tested in a beaker. However, they clearly do not have the same pH on the surface of the tortilla itself. 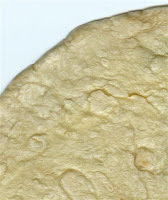 Each of these tortillas have been sprayed with a solution of Bromocresol Purple 0.04% w/v. On the left tortilla, the yellow spots indicate low pH and the blue spots indicate high pH. This tortilla on the left will mold in the areas of high pH. The tortilla on the right does not show any “hot spots” for pH. 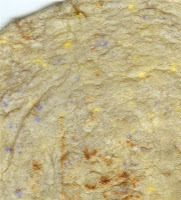 These spots of low pH (yellow) are probably due to particles of fumaric acid that did not completely dissolve in the tortilla. The spots of high pH (blue) are probably due to particles of sodium bicarbonate that did not completely dissolve. This demonstrates the importance of the particle size and solubility rates for ingredients that contribute to the final pH of a tortilla.